Naturally when rainwater falls on the ground, it percolates down to water table through soil voids and goes to aquifers, but these days our civil structures everywhere are hindering the natural path. The scarcity of fresh water has been an ever-present issue for the residents of Kathmandu. Moreover, depletion of groundwater is decreasing access to water in many ways. The tenants are forced to keep shifting as the homeowners ration the limited water due to low supply of water. This problem is going to increase unless it is given a high priority and dealt with properly. Water is an essential element for life and required for most activities of human society. So our concern from now on should also be on water safety, especially on replenishing groundwater reserve of Kathmandu. More than 50 per cent of water supplied in Kathmandu comes from the ground. The water crisis is a perennial problem in the Capital. As the water supply and demand situation of the Capital is sensitive and dreadful, people are highly dependent on groundwater. This has caused huge stress on aquifers of the Valley. Almost all households in Kathmandu depend on tube wells, boring and other methods to get water. A study conducted in 1990 by Japan International Cooperation Agency (JICA) suggested sustainable draw rate of 0.027 million cubic metre per day. According to Cresswell et al (2001), our consumption rate is 20 times more than recharge, and at this pace, our water reserves would diminish within 100 years. Many of us depend on groundwater for almost all water-related activities including drinking. Authorities are also extracting groundwater to supply over taps and for irrigation. Some densely populated areas of the Kathmandu Valley are already showing bad signs. For example, people are increasing boring depth significantly and dhunge dharas (stone water spouts) are drying out. Until a few decades ago, these dhunge dharas were the only source of water for many people in the Valley. Since people are now increasingly drawing underground water, the water table is going down, which could result in ground subsidence. According to data on “Kathmandu Valley Groundwater Outlook” from AIT, the average water level decline is about 1-4 metres per year since 1984. The hydrological cycle keeps the water tables recharged with ways like percolation after rain but the system is imbalanced when recharge is far less than consumption. The situation is similar in the neighbouring country India due to similar consumption pattern, population growth and overexploitation trend. India’s NITI Aayog’s Composite Water Management Index report of 2018 says that by 2020 major cities like New Delhi, Bangalore and Hyderabad will reach a state of zero ground water level. Over the top, these Indian cities also have a very low water supply through municipal taps similar to Nepal. Both countries have uncontrolled rampant boring for private, institutional and agricultural use. India is suffering the worst water crisis in history. So by observing this, we Nepalis also must understand the severity of the imminent issue. There are a few organisations such as WaterAid Nepal and UEMS and some individuals who are working in the field of groundwater recharge. They have installed combined rainwater harvesting systems in various parts of Patan. These recharge systems have shown an excellent result in replenishing the lowered water table. Most of the rainwater makes its way to drains and rivers but it can be easily used to replenish our water reserve. This free source of water certainly can save our reserves if we implement the mitigation measures carefully. Naturally, when rainwater falls on the ground, it percolates down to the water table through soil voids and goes to aquifers, but these days our civil structures everywhere are hindering the natural path. The organisations working in rainwater harvesting have placed recharge pit and wells in high tension zones. They have made rainwater harvesting solutions at home using the simple roof, gutter, collectors and PVC pipes. Thus collected water is sent to a small well or pit which absorbs water and sends it to underground aquifers. We need to plan and implement similar solutions as soon as possible. Some organisations in Nepal are doing what they can, but the government also needs to implement new and farsighted policies to ensure we are on right track to save our future. In India, the populated metro cities are facing high tension. Bangalore has a similar case so the government is pushing people towards rainwater harvesting. 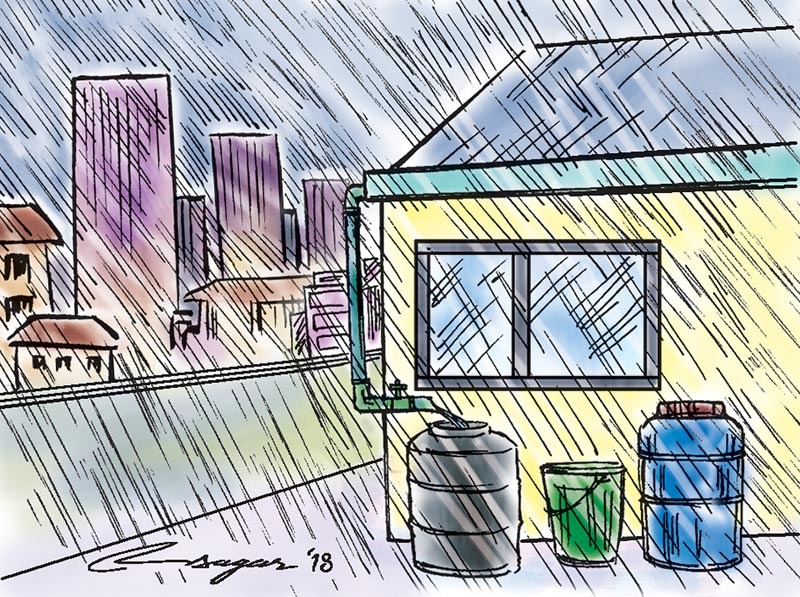 The households who don’t have rainwater harvesting should pay penalty with their water bill. This rule was implemented in Bangalore on May 1, 2016. Detailed and more accurate studies are essential for Kathmandu to understand the situation and find better solutions. New infrastructure development roadmap of our country should be able to accommodate measures to ensure water safety for the future generations to come. Water is our precious property and resource thus it is our responsibility to protect and preserve this asset. Groundwater is a reserve with the most valuable element of life. So we need to think about its preservation and do the necessary and help as far as possible to ensure the safety of water and the safety of our future.